Color of Chōshū army at Boshin war. This dream would eventually be realized some 260 years later, when the domain joined forces with the Satsuma Domain and sympathetic court nobles to overthrow the Tokugawa shogunate. 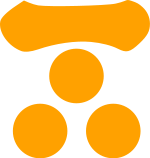 In 1865, the domain bought a war-ship Union from Glover and Co., an agency of Jardine Matheson established in Nagasaki, in the name of Satsuma Domain. 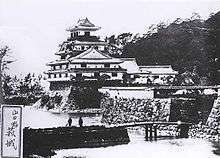 They led the fight against the armies of the former shogun, which included the Ouetsu Reppan Domei, Aizu, and the Ezo Republic, during the Boshin War. 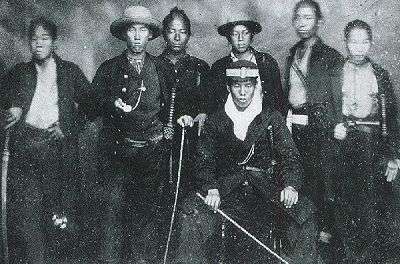 The domains' military forces of 1867 through 1869 also formed the foundation for the Imperial Japanese Army. Thanks to this alliance, Chōshū and Satsuma natives enjoyed political and societal prominence well into the Meiji and even Taishō eras. The Mōri daimyo, as with many of his counterparts throughout Japan, was assisted in the government of his domain by a group of karō, or domain elders. There were two kinds of karō in Chōshū: hereditary karō (whose families retained the rank in perpetuity) and the "lifetime karō," whose rank was granted to an individual but could not be inherited by his son. The lifetime karō were middle or lower samurai who displayed great talent in economics or politics and were promoted to karō by the daimyo. One such person was the great reformer Murata Seifu. 1 2 Deal, William E. (2005). Handbook to Life in Medieval and Early Modern Japan, p. 81.